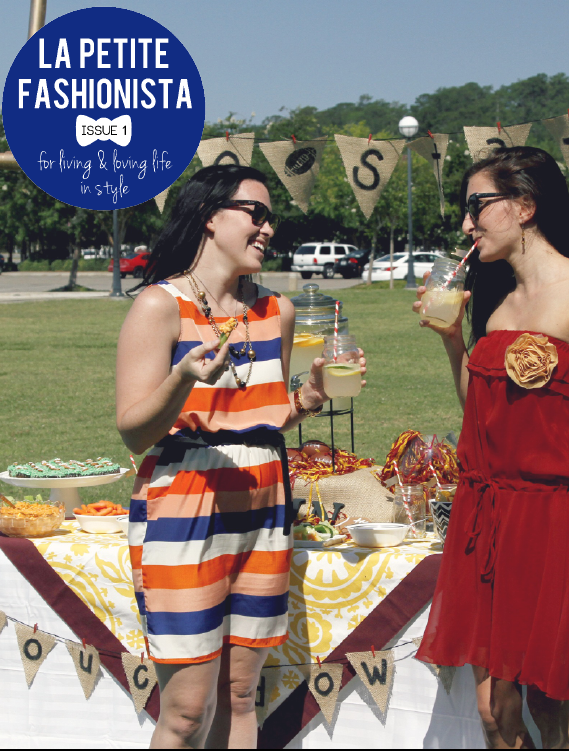 Fellow blogger and friend, La Petite Fashionista, just launched her newest endeavor - LPF Magazine. It's full of fantastic editorial content from recipes, to fashion and DIY. She dedicated a few pages to our favorite topic - tailgating in style. I was honored to contribute to the feature with my 5 tips for a fashionable gameday. Wear cute but comfortable shoes. Wedges or sandals in the warmer temps. Boots and TOMS in the cooler temps. Cross body bags are a must - they free up hands for holding drinks and tailgate snacks. Weather can be unpredictable, packing a lightweight sweater or poncho in your bag is always a good idea. Keep a small makeup bag in your purse to touch up the morning's look, as well as sunscreen and lip balm.